One could say that the shutter of The Parish last October marked the beginning of the end for LA's gastropub craze. Or perhaps, the movement is shifting focus to its next evolution, the so-called "ethnic" gastropub exemplified by the likes of Bizarra Capital, Badmaash, Corazon & Miel, and tonight's subject, Peking Tavern, which just happens to be located in the basement of the National City Tower Lofts in Downtown, a stone's throw away from The Parish's former digs. 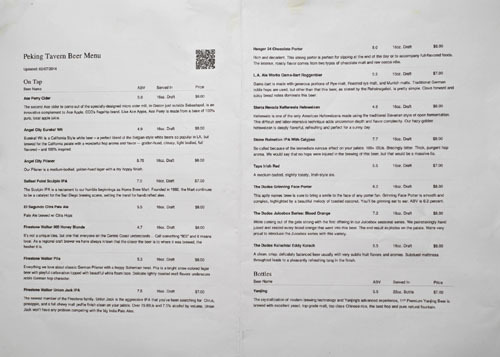 Peking Tavern's advertised as a Chinese--specifically Beijing--gastropub, one dedicated to Northern-style street food and home-style cookery. The place soft-opened at the start of October 2013, coincidentally mere days after The Parish's closure, and is the work of partners Andrew Chiu and Andrew Wong, two longtime friends who met while attending the USC School of Architecture in the late 1980's. Following graduation, the two went their separate ways, but both eventually landed in China, where they reconnected and developed a taste for Chinese cuisine. 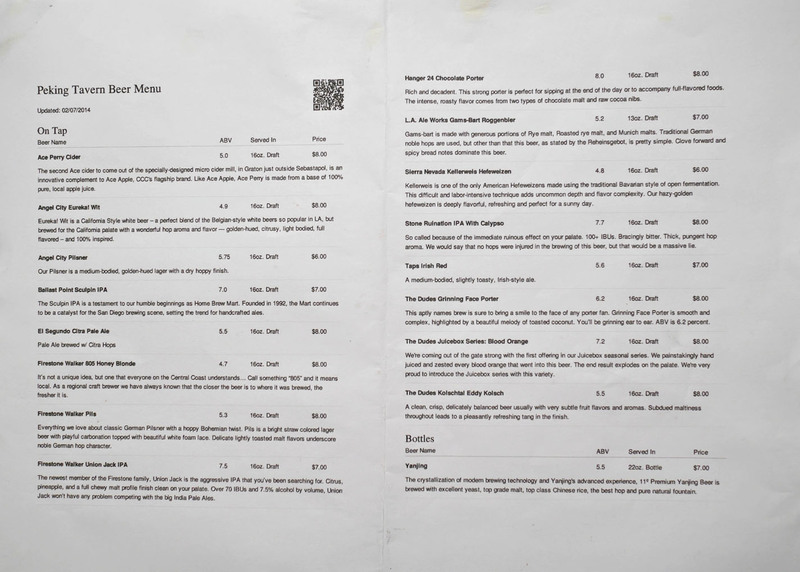 The Andrews returned Stateside in 2011, and soon started work on Peking Tavern through their newly-founded hospitality design and consultancy firm El Guapo Group LLC, best known for their work on Sandwich Smith/Fickle in Little Tokyo. The Tavern is far from a chef-driven sort of concept, but nevertheless is ostensibly headed by two O.G. Chinese chushi: Tianjin native Ms. Liu from the old 100 Dumpling House in Monterey Park and dumpling/noodle specialist Danny from Hong Kong (who's also worked in Japan and at Mr. Chow apparently). Along with Crane's Bar, Peking Tavern's housed in the basement of a 12-story, 1924-era Beaux-Arts building that also holds the DTLA outpost of Terroni on its ground floor. The elongated spot takes up just under 3,000 square-feet and is pretty bare, with just a hint of old school Chinatown from those lanterns. A bar lines most of one wall; mirrored by a row of communal high-tops, while the rest of the room is filled out by regular tables. Large windows in the dining room, meanwhile, afford patrons a view of the kitchen's noodle making station. 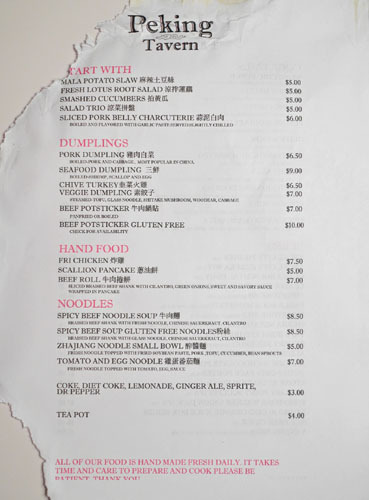 The Peking Tavern menu is refreshingly short, a selection of starters, dumplings, noodles, and hand-y type dishes that don't change much save for the occasional special. Click for a larger version. Though the food is pretty traditional, the beverages are more unexpected. 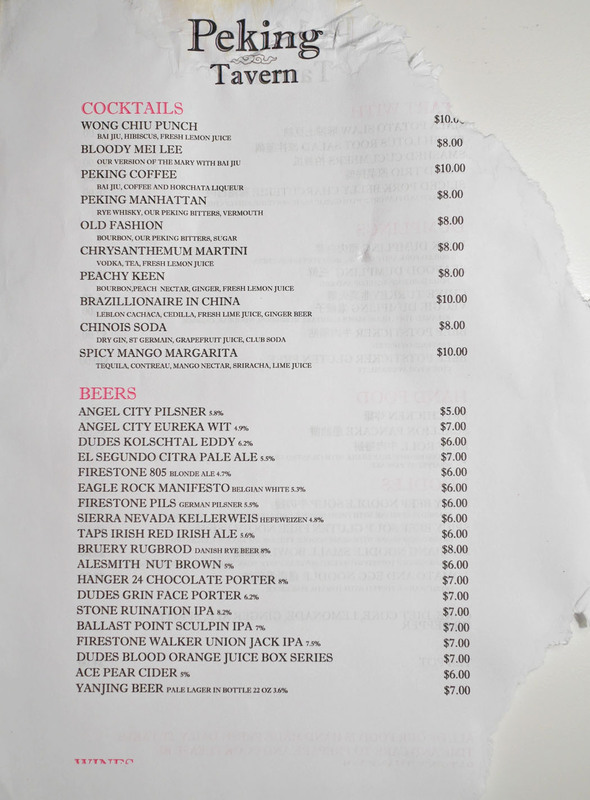 There's a pretty nice selection of 18 beers on tap (along with Yanjing in bottles), along with a handful of wines, but everyone seems to be talking about the cocktails. 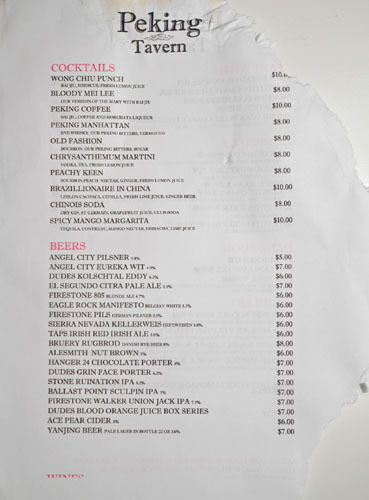 Early on, it was reported that Lindsay Nader was designing the list here, but it ended up being the work of Cari Hah (Cole's, Neat Bar, The Varnish), who's now at the new City Tavern. 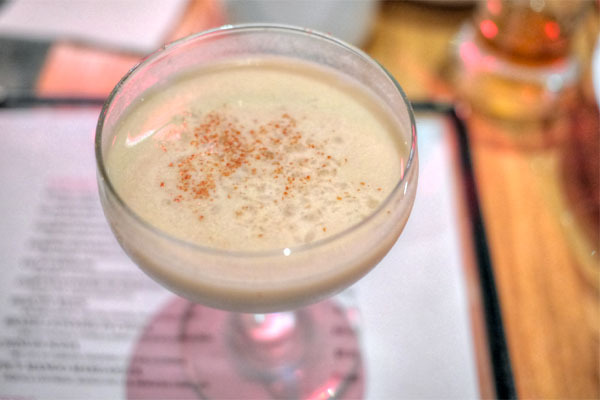 Nevertheless, her influences are still seen all over the menu, especially with the much bandied about baijiu cocktails, made with Red Star erguotou. These days, the beverage program is largely overseen by Sybil Lin, who also serves as the restaurant's GM. Click for larger versions. 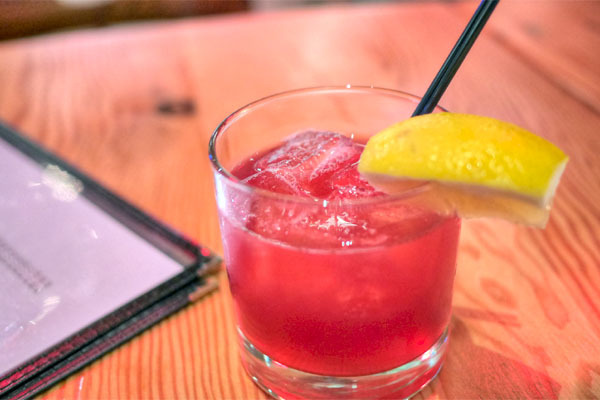 The restaurant's signature cocktail is named after its two owners and represents an approachable introduction to the world of baijiu, the weight of the liquor effectively cut by the sweet, floral hibiscus and sour notes from the lemon. 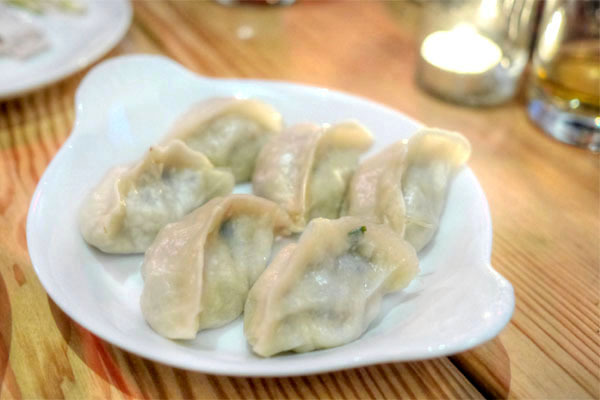 Jiaozi here are all made on-site, and we began with the most prototypical of them all. 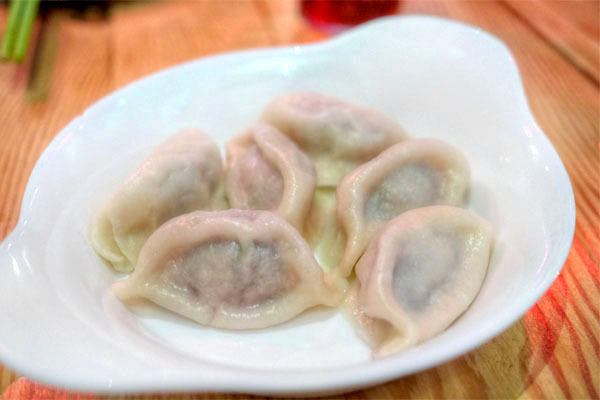 Served six to an order, they were a commendable preparation of the classic, the pork arriving flavorful and juicy, the veggies adding a perfect counterpoint to the dumplings. The skins were also on point, and a combination of soy sauce and vinegar served as a great accompaniment. Our next cocktail featured bourbon as a base, the booze nicely paired with the sugary peach while ginger and lemon contributed a bright accent to the drink. 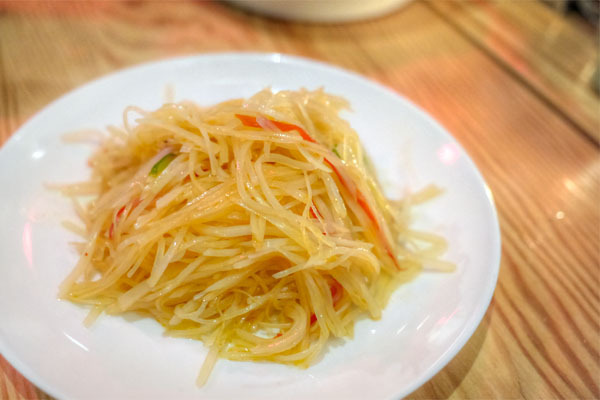 I was quite a fan of the mala slaw, really taking a liking to the thin, crunchy strands of potato and how they played off of the zesty, slightly numbing character of the chili oil. Guotie were delicious as well, showing off all the classic goodness that you'd expect in a potsticker. Lovely texture on the pan-fried skin, too. Peking Tavern's take on the niu rou juan bing was certainly praiseworthy. The beef shank itself came out properly tender, conveying a combination of savory and sweet that went superbly with the zing of scallions and cilantro. The wrapper, meanwhile, was nicely thin, and pretty flaky too, a fitting vessel for the meat within. One of my dining companions even thought that this compared favorably to 101 Noodle Express's legendary version of the roll. Time for some beer. 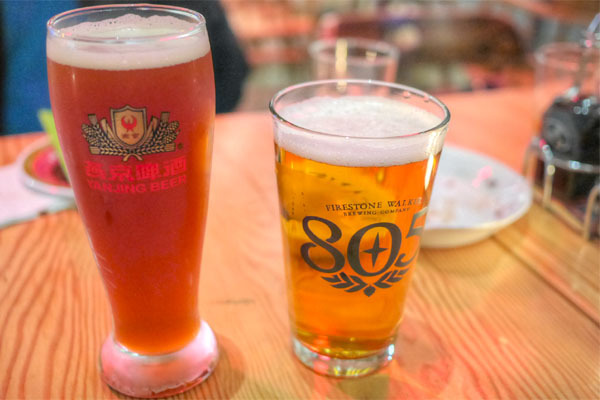 I wanted to sample the Firestone Walker 805 Honey Blonde [$8] since the brewery was actually in the house this evening promoting their wares. I'd never tried it before, but found it quite enjoyable, an easy-drinking, sessionable brew, nicely balanced with notes of sweet malt and cereal-y character, along with a light hop quality. It's probably something that every beer drinker can enjoy. The same, however, could not be said of the L.A. Ale Works Gams-Bart Roggenbier [$7], which was much more of an acquired taste. 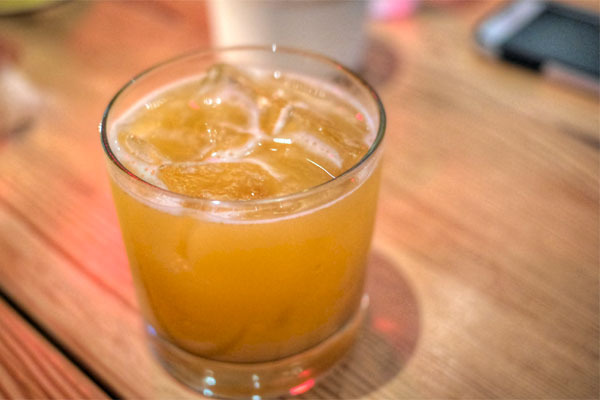 Think spicy, and smoky, yet light, with a distinct breadiness and bitterness from the use of rye. The cong you bing was a legitimate preparation of the traditional scallion pancake. 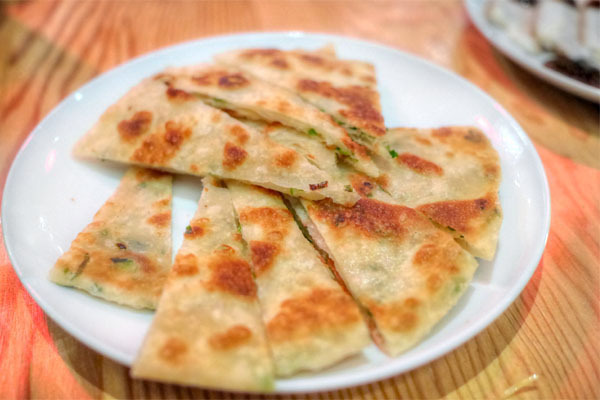 The flatbread displayed the mild savor of the dough, interjected with pinpoints of astringency from the green onion. Tasty alone, but even better when eaten with the pork belly below. Next up were shrimp and scallop jiaozi, which made a surprisingly strong showing. The seafood folded within was pretty much perfectly cooked, not overdone at all and really imbued with a savory brine that paired swimmingly with the included chili sauce. 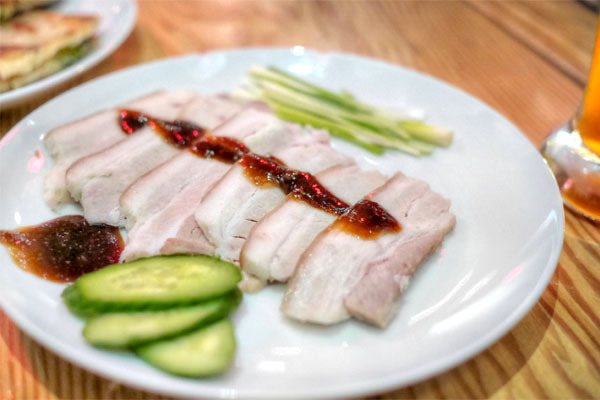 I was a fan of the chilled pork belly too, finding the relatively subdued slices of meat a fitting pair to the piquant kick of the included condiment, all while the cucumber and scallion added a much-appreciated bit of brightness to the mix. As I mentioned above, I'd suggest taking the belly and its various accoutrements and wrapping them up in the scallion pancake. The combination was suggested by one of the Andrews, and made for a pretty amazing bite. Vegetable dumplings, unfortunately, were the least successful dish of the night. I didn't have an issue with the actual filling per se, as the amalgam of noodle, tofu, shiitake, cabbage, and mu er made for a mélange of tastes and textures. Rather, the skin was my concern, as I found it overly tough and a bit chewy, probably a result of the steaming process. I think they'd be better pan-fried, or perhaps boiled. 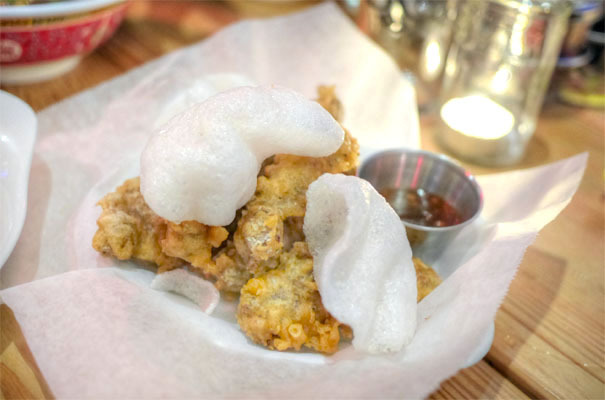 Peking Tavern's take on fried chicken is worth a try as well. It wasn't what I expected actually, with boneless strips of meat coming out with a light, crisp, almost karaage-esque batter. Flavor-wise, the chicken delivered in spades, bringing forth loads of savory, spicy nuances that were further intensified by the condiment on the side. 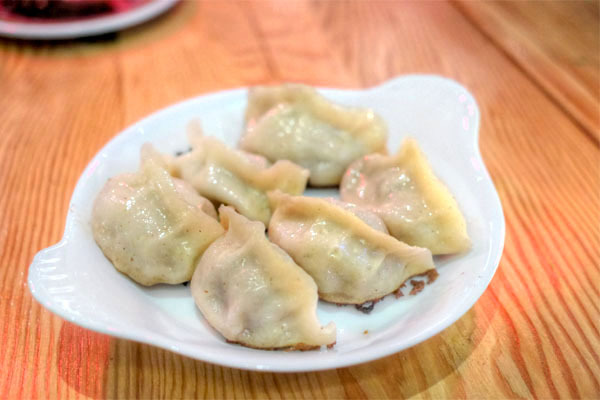 Jiaozi of turkey and chive were enjoyable, though not as exciting as some of the other options here, presenting a flavor profile reminiscent of a less robust version of the pork dumplings above. The niurou mian was a must-try for me, and didn't disappoint, with the tender cuts of beef working hand-in-hand with the cilantro, tangy suan cai, and slippery noodles to form an utterly satisfying eating experience. The best part? 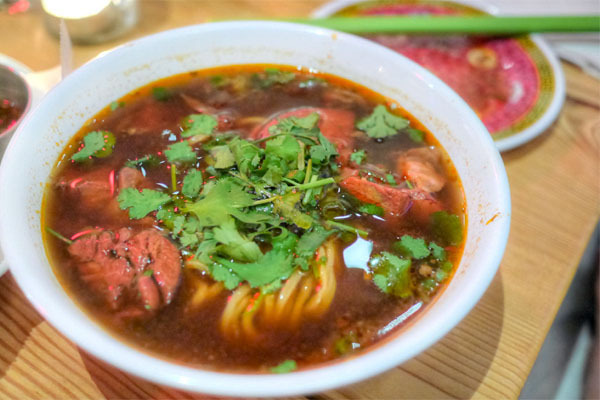 That wonderfully spicy, aromatic, deeply-flavored broth, which we eagerly supped up at the end. Getting back to cocktails, what we had here was easily the most "dessert-y" selection on the menu, with a load of sweet spice to go with the strong coffee elements in the drink. You could barely detect the baijiu, and it did occur to me that this might just be fantastic as an ice cream. Here we had Peking Tavern's take on zhajiangmian, made with hand-pulled noodles (a special request). 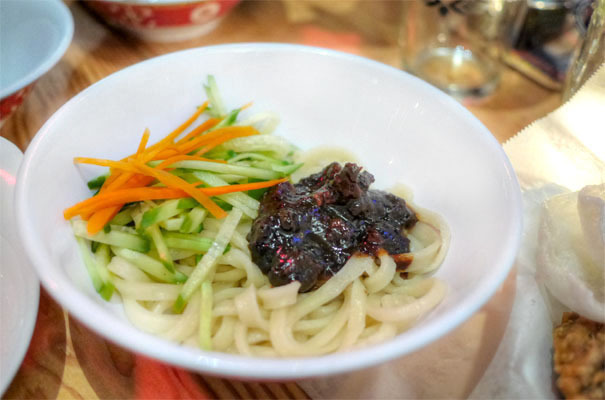 The dish delivered as well, the dark, umami-laden relish of the fermented soybean coating each and every noodle, its weightiness lightened up by the bright crunch of cucumber and carrot. Very nice texture on the lamian, too. 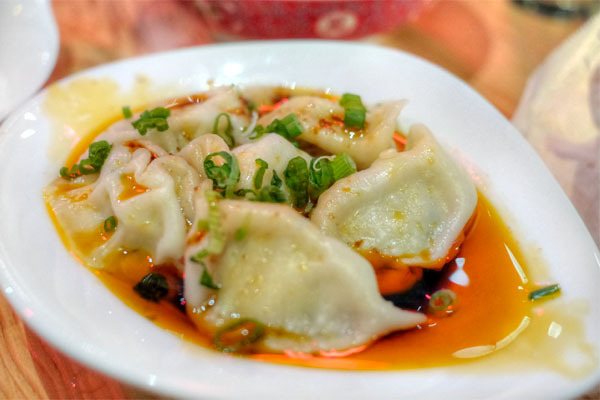 An off-menu item you should definitely get is the restaurant's version of hong you chaoshou, basically Sichuanese-style fish wontons in hot chili oil (priced at $8.00). 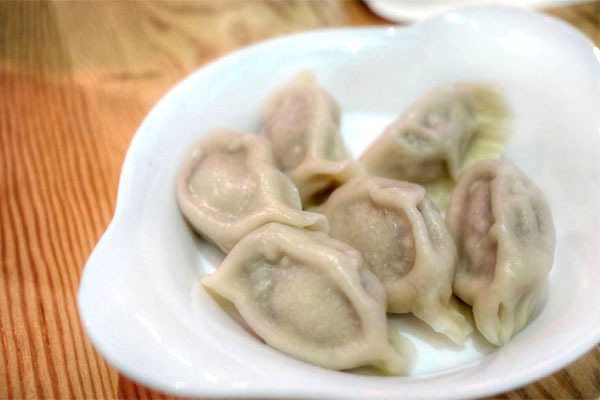 The dumplings themselves were spot on, the essence of the fish really coming through. But taken with the spicy oil...talk about a winning combination. 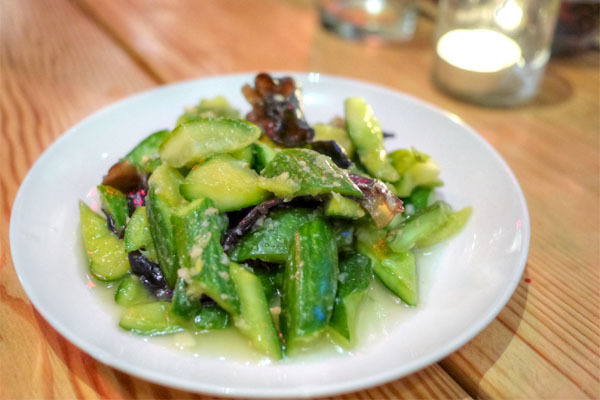 Cucumbers were light, bright, and crunchy, a refreshing respite from our heavier courses with its garlicky, salty-n-sour jolt. I appreciated the incorporation of wood ear here for texture, too. We ended, appropriately, with the tomato-egg noodles, a homey, comforting sort of dish that rendered the classic combination of the two ingredients over a base of slick, slightly chewy glass noodles. I'm happy to report that I was pleasantly surprised by Peking Tavern. I'm no expert in SGV dining, but from what I can tell, the dishes here do largely stand up to what the Valley has to offer. Add to that the comfy environment and a lovely selection of booze, and you get a really welcomed addition to the Downtown scene that we've been missing for some time now. It's the sort of place I could envision myself visiting regularly if I lived in the area. I would, however, like to see some sort of dessert option offered here in the future (shaved snow or ice cream come to mind). The food looks delicious, albeit fairly traditional in preparation. I hope that you are right about a trend towards ethnic food. 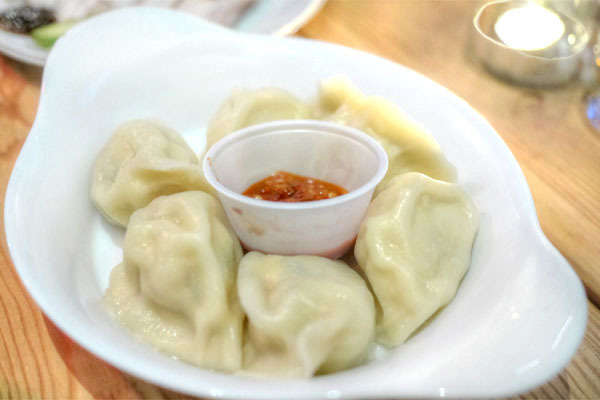 Los Angeles is a treasure trove of ethnic food, but with a wide dispersion in quality. Some friends took me on a tour of Koreatown gems, and many of the restaurants offered mediocre menus with one or two outstanding items. When you think about traffic, and disappointing meals, there are fairly high search costs. People in the know might scoff at the price premiums, but it's a fair trade for the curatorial function. place is pretty decent for DTLA without being exuberant in cost. Tough to find good noodles in DTLA. Doesn't compare to the top spots in SGV but it's still pretty good. Al: Definitely agree about K-Town. You really have to rely on people who know what they're doing. I'm not even completely comfortable myself venturing out there. Scott: Don't worry, I didn't forget about LP. It's here. Charlie: What are your top spots in SGV? And how's the beef roll stack up to 101's? I actually tried it a few days after this meal, and I didn't think it was as revelatory as I was hoping for. I have almost 30 LA Chinese joints in my Chinese Food Index, mostly in the SGV. This certainly looks a little more "trendy" than most of the valley fare, but not as varied either. Lots of straight up dumplings it seems at Peking Tavern. Nothing wrong with those, but hardly radical. 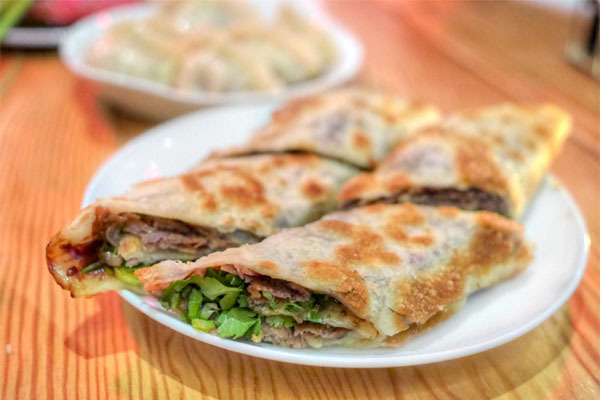 Roc (on Sawtelle) actually has a great beef roll and scallion pancake. 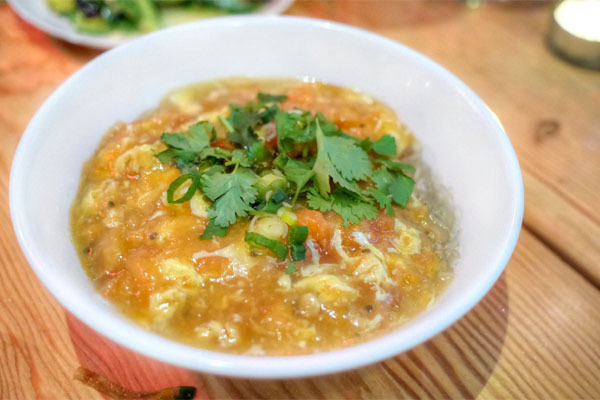 But I personally adore good Schezuan like Chengdu Taste or my favorite, the undiscovered Cui Hau Lou.